On Christmas Eve, I was thinking about this past year. I’ve been doing that a lot lately! We started off 2010 with a heart Cath and planning to go home the next day. The next day we were rapid responsed back to the ICU. We ended the year with Annabelle at home, new heart intact, doing well except for a continuing cold. The days in between were… crazy. That’s a good word for it! I started off the year employed with a good, solid (yet stressful) job, and ended it a stay-at-home mom. The year started with me dreaming of having a book published some day, and it ended with a book contract in hand and first set of edits complete. It started with my hubby having one part-time job and being a stay-at-home daddy, and now he has a full-time (temporary) job on top of the part-time one. Yeah, we’ve had just a little change up in 2011!! As I reflected back on December, a little part of me was sad. I’d so wanted to “enjoy” Christmas this year. Okay, take that back, I ENJOYED it very much. But I had visions of taking the month to be mom-of-the-year and being organized and doing fun Christmas stuff with my kids and not being hurried and just enjoying every second. I, instead, spent the majority of it with my face in my computer, feverishly trying to complete rewrites on my book to make my pre-Christmas deadline while hurrying through Christmas preparations. But… there’s always next year, right? The moment I thought it, something huge hit me. I have NO CLUE what the next year will hold. The possibilities are endless, and range for fantastic to tragic. Life is never sure, and it’s always changing. Just a few days ago, two families in our small town lost a dear member of each family in a tragic car accident. A Father in one family, and a 5th grade girl in another. I look at my husband, and at Karalynn, my own 5th grader, and it hits me hard to know that it could have been one of them. We are never promised another day. I read a statistic the other day that I just happened upon looking something up. It said the 5-year survival rate of heart transplant recipients is 70%. I’m not being pessimistic here, but realistic. Life with Annabelle will always be a daily gift. One I treasure more than I can express. On a less tragic mode, I realistically know that while I’m able to stay home at the moment, something needs to happen to be able for us to sustain this. I’m at a complete loss as to what that will be/needs to be. I’m trusting that God knows though. God could choose to “wow” us, or he could choose to make us walk the edge of faith where we are grasping on a day-to-day basis. I’ve determined to trust him and praise him regardless of which way He decides to take us. And my book releases this year! Big questions remain in my head. Will it sell? Will I be able to figure out the whole thing that is Marketing? Will I be able to get another contract for another book? And on a more elemental level, what will God do through my writing? My prayer, book contracts aside, is for God to use my words for His Glory. It’s the reason I started writing in the first place. Many people get one word for the year instead of making goals and resolutions. This is what I see for 2012, and what I feel like God is telling me. That’s it. A question mark. I think God is telling me what He has all this past year. That He knows, and I don’t, and I need to live each day in faith and trust to him, regardless of what happens. Whether this is a year of being wowed or being humbled. What about you? Do you do a word of the year? Do you make resolutions or goals? What are your thoughts as we begin a new year? I leave you with this fun picture from Physical Therapy last week. The newest feat for Annabelle. She’s still wobbly. Still perfecting it. But yes… that is some standing my baby is doing!!!!!!!!!!! This last year was a whirlwind for you but you came through with God as your guide … next year you'll come through either. God doesn't change and you have your feet firmly on the Rock! I don't do New Years resolutions, but that one word for the year I like!! My word? Adventure! I closed some doors in my life (with God's permission) and now it's one big adventure to see what doors God will open for me. Yay for Annabelle! How great to see her progress so wonderfully! I pray that this coming year will be the best ever for you and your family! Wow! Standing! That is amazing! You know, I have a blog post scheduled for this Wednesday about how God doesn't give us a detailed map of what's ahead. Lest we feel overwhelmed. Instead, He gives us our daily bread. Just enough to get through each day as it comes. I love your heart and your faith, Krista. Really great post, Krista. It can be hard to go into a new year with ?? 's but BOY does it build faith! Happy new Year to you all, Krista. 2011, though with many glorious moments, was one of the hardest of my life. I'm glad to see the back of it and am praying for a more BORING 2012. 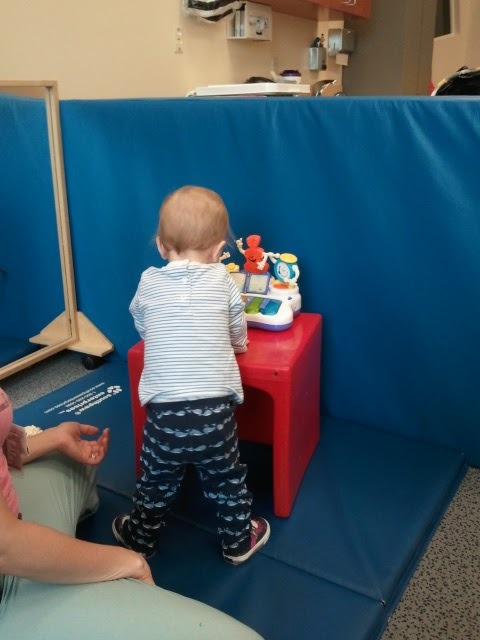 I love the pic of Annabelle standing at therapy. She's come a long way and I can't wait to see the pics of when she starts to walk. Sherrinda… yeah for WW!!! You must join in our SKINNY FRIDAY fun as well!!! Riete! Adventure! I love it! Not sure I'll claim that as my own though. HA! I can just imagine what God would come up for that! Katie… we're pretty pleased about standing. December was a month of HUGE HUGE LEAPS for Annabelle. It was amazing to see! God most certainly does not give us a map. I used to bemoan this. Now I'm oh-so thankful. I realized about halfway through Annabelle's 10 months in the hospital… that if I'd been forewarned that she might be in the hospital for that long, I'd have fallen apart very early on. This momma would have had to been highly medicated! One day at a time, that is what God wants us to do. Mary… I'm praying for a boring 2012 for you too! Although, I'm not sure I've EVER had a boring year. That's right, EVER. I think God knows I don't do boring well, HA! Casey… ? ARE faith building. And the thing is… they can be really really good, too! While I'm really praying/hoping for a year full of GOOD ? 's… I'm trusting God regardless of what he brings. Tammi… EEEE ! Walking!!! It'll be a little while, although I said that about standing too, so who knows! HA! Woohoo, Annabelle!!! She is getting so stinkin' big, I can't believe it! Karen and Caroline… thank you! Sherrinda… I've given birth to 4 children… I won't be either. But I STILL believe in speaking into the positive! Skinny…er… than! Sarah… EEEE!!! I can't wait for that EITHER!!!!AHHH!!!! Awesome, crawling and now standing! Praise the Lord! That's great Annabelle…you are thriving and God loves You So Much!!!! Krista you are such a Positive role model….in everything God is Our Refuge and Our Strength!!! Praise be to God for All that He has Done In Your life as Well as Annabelle and All the family!!! Good luck with your book…..You are doing so good!!! I continue to Follow your Blog! !